Kraken Black Spiced Rum and agency Technology, Humans, and Taste (THAT) are launching what the alcohol brand calls its most ambitious advertising campaign to date. The creative is designed to appeal to the brand's longtime audience of comic book/ gaming fandom by playing on the brand's origin story—about a supposed squid-like sea monster that dwells in the North Atlantic. 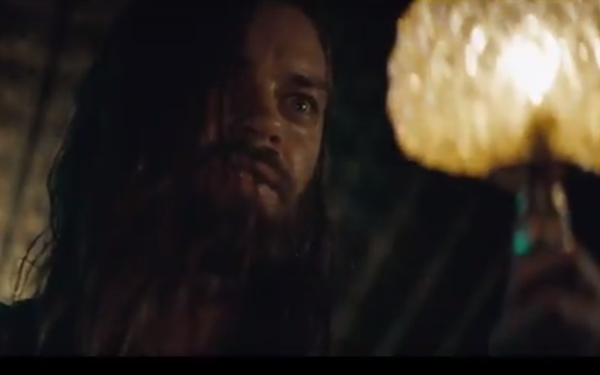 One 30-second spot shows grizzly tavern patron Tom Payne (of "The Walking Dead" fame) recounting his encounter with the monster before the creative ends by asking "What is your story?" Viewers are then encouraged to submit their own stories via the brand’s website as well as join its exclusive membership program, the League of Darkness. “Rather than portray the antihero through a CGI depiction, we chose Payne to bring the Kraken into the real world,” says a Kraken spokesperson. "The story he tells we believe will resonate much wider in the imagination of our audience." The spot airs on networks including FXX, Comedy Central, BBC America, IFC, and SYFY, during shows such as "It’s Always Sunny in Philadelphia," "The Simpsons," and "Doctor Who" through October 31. The campaign will also feature tastings and fan appreciation activities at live gatherings including Big Adventure Music Festival and Turner E-League competitions. “Our goal when we created the ad campaign was to evolve the brand creatively and strategically to encourage the consumer to spill their own seaworthy tale,” says Nathan Phillips, creative/managing partner, THAT. "The Kraken celebrated a story that was told at bars by sailors a long time ago, and we wanted it to be about stories that are told at bars today by everyone; to make the consumer part of the story at every touch point."